Back in August we featured Pecorino Toscano, a true favorite of ours here at the club. 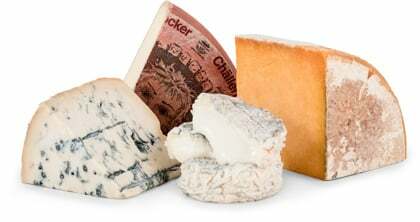 As you may recall, Pecorino is the name given to all Italian cheeses made from sheep's milk. 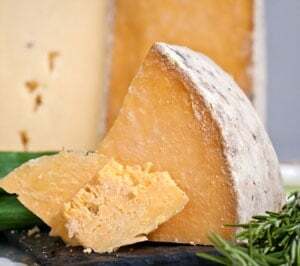 Most Pecorinos are oily cheeses because sheep's milk contains very high amounts of butterfat, one of the reasons this cheese is so delicious. The high butterfat content explains the beads of oil you usually see when Pecorino is at room temperature. Called “butterfat tears,” they weep naturally from the cheese. Use them as a gauge to indicate that cheese you have left out of the refrigerator for a while is the perfect temperature for eating. Pecorino Pepato is a gourmet Italian sheep's milk cheese studded with peppercorns. It's an intense, salty cheese that can be appreciated on its own, but as a seasoning for pasta, especially with fava beans or tomato sauce, it is especially hard to match. Traditional pecorino pepato comes from Sicily, where it is part of the regional cooking. While you wouldn't think to add pepper to a glass of milk, it does add a special piquancy to other dairy products. In India, lassi, a cold yogurt drink, is often made with black pepper. In France and Italy, peppercorns are added to superb cheeses. Embedded with whole black peppercorns, Pecorino Pepato has a peppery taste that bursts across the palate. Pecorino's flavor is dense, and the peppercorn sensation will bring new dynamics to your next meal. Pecorino is usually eaten as a table cheese but consider shaving it on top of fresh beans (perfect for summer salads) or lightly sautéed greens. Use it instead of Parmigiano, grating it over a plate of hot pasta dressed with olive oil and garlic. If you're a big pepper lover, add a bit of coarsely ground pepper to the elegantly simple supper as well.